Thanks to the Lunar Reconnaissance Orbiter, we can now see the Moon's mountains and craters in unprecedented detail. This beautiful topographic map is going to be an invaluable resource in planning the next generation of lunar missions. The map covers about 98.2% of the lunar surface, with the sole exception of some eternally dark polar regions that the Lunar Reconnaissance Orbiter couldn't photograph. Despite the fact that we've been visiting the Moon for a half-century, our knowledge of its topography has been frustratingly inexact, mostly because previous instruments just weren't up to the task of precisely measuring every last inch of the lunar surface. NASA's Lunar Reconnaissance Orbiter hasn't quite gone down to the last inch, but it's a pretty good approximation - every pixel in this image represents about 100 square meters, the equivalent of two football fields placed next to each other. 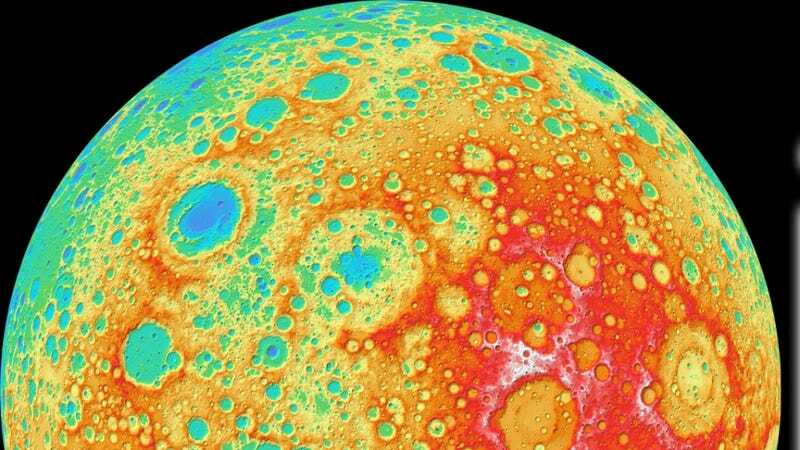 That level of detail is a huge jump forward in our knowledge of the Moon's topography, and this new knowledge will be vital to planning out future probes and hopefully crewed missions. You can see a more complete view of the Moon by expanding the image on the left, which shows the complete topography of the far side of the Moon. "Our new topographic view of the moon provides the dataset that lunar scientists have waited for since the Apollo era. We can now determine slopes of all major geologic terrains on the moon at 100 meter scale. Determine how the crust has deformed, better understand impact crater mechanics, investigate the nature of volcanic features, and better plan future robotic and human missions to the moon." So how did the satellite create the map? The LRO's Wide Angle Camera, or WAC, worked in tandem with two Narrow Angle Cameras, or NACs. While the NACs take high-resolution shots over small areas, the WAC takes 100-meter resolution images in seven different color bands over an area of the moon covering roughly 57 kilometers. For all its imaging power, the WAC itself is a tiny instrument, small enough to fit into your hand. The WAC completely maps the Moon about once a month, and because light conditions keep changing, each time the WAC is able to capture more information about how the rocks reflect light under different conditions. The WAC's photos contain substantial overlap, offering multiple views of each patch of the Moon. This allows the LRO's imaging system to resolve the terrain and create the topographic map with an extremely high degree of confidence. While the WAC can't take photos of the darkest polar regions, there's another instrument on the Lunar Reconnaissance Orbiter that can help out. This is the Lunar Orbiter Laser Altimeter, which as you can probably guess from its name bounces lasers off the surface to determine elevation. Since the Lunar Reconnaissance Orbiter frequently passes over the poles, it's been able to fill in a lot of the gaps in the WAC's original topographic map. The original grayscale image has of course been colored in to more clearly reveal the different altitudes, which can range 10,000 feet above and below the lunar surface, thanks to all of the Moon's many tall mountains and deep craters. For many more awesome views of the Moon's topography, check out Arizona State's project page.